Azucar Bakery guarantees to do our best to make your custom cake a very unique memory. 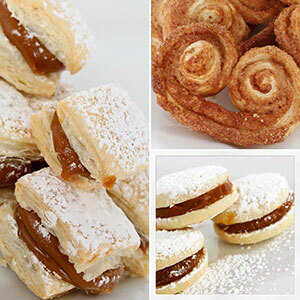 ALLERGIES: Please note that Azucar Bakery IS NOT a gluten-free, nut-free, nor dairy-free facility and that we do offer items within our store that contain all of the aforementioned. In addition, even though we try our best to avoid any cross contamination in our facility, some of our ingredients may come from third-party manufacturers with nuts in their facilities. It’s never too early to place your order! Our order book often fills up quickly and there are times that we will have to stop taking orders, this is especially likely to occur during the summer months. Online Orders: Online orders MUST be placed at least 7 days prior to your desired pick up date. Custom Wedding Orders: We highly recommend placing orders for Wedding cakes at least 6 months in advance to secure your desired pick-up/delivery date. Custom Cakes for all other occasions: We highly recommend placing orders for Custom Cakes as soon as possible or at least 2 weeks in advance to secure your desired pick-up/delivery date. Basic Last-Minute cakes: We typically have a few different sizes and flavors available at the bakery on a daily basis for those times when you just need something simple to grab & go. Please stop in or call the bakery directly to inquire about what is currently available. What is the difference between a Layer and a Tier? In the event of cancellation: Custom cakes cancelled prior to the 14-day lockout date will receive the deposit amount in the form of store credit to be used within 6 months of original event date. Cakes cancelled after the 14-day lockout date will not be refunded, no exceptions. In the event that something occurs to affect your scheduled event date – please contact us immediately to discuss options.. CUSTOMER PICKUPS: We do not advise transporting cakes more than 2 tiers yourself. We will do our best to pack your cake safely, and provide proper infrastructure, as well as advise you on how best to transport your cake, however Azucar Bakery cannot be held responsible for anything that should happen to the cake once the cake leaves the bakery. Please inspect your cake carefully before leaving the bakery. 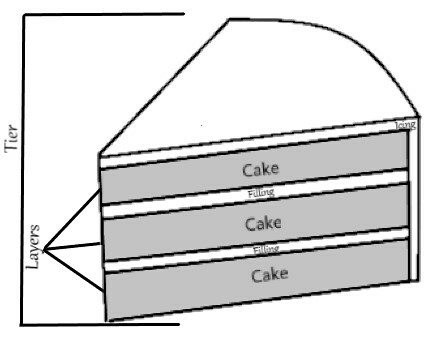 Your custom cake will be designed to serve the number of servings indicated on your order form.Serving sizes are based on industry standards for cake size/shape. ACCESSORIES/FRESH FLOWERS: *Fresh Flowers – Your florist will need to provide any fresh flowers, but Azucar Bakery will be happy to place them on the cake at your venue for no additional charge. 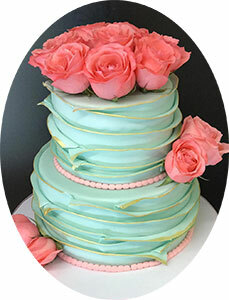 Your florist is responsible for ensuring the flowers are safe to place on an edible cake. Flowers must arrive on time & be left next to the cake table. If the flowers arrive late and/or you prefer your florist places them on the cake, we are not responsible for any damage to the cake. You will need to make arrangements for your cake knives, servers and cake toppers. Any or all of these items should be left on the cake table at your venue for placement. 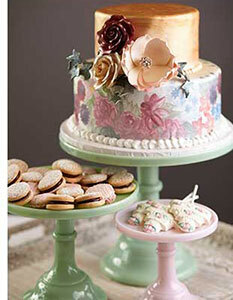 A variety of cake stands are available for rent, based on availability at the time of your order. All pieces of the cake set/stand must be returned to Azucar Bakery by 3 days following your event. Late return or damaged pieces will result in the forfeit of your deposit and/or full replacement cost of the stand (whichever is greater). Inedible materials such as a ribbon, crystals, rhinestones, etc. will be provided by the customer. These items must be delivered to the bakery 2 weeks prior to your event date. DESIGN CHANGES: Changes to your cake order: size, description, flavors, etc. will be accepted until 2 weeks prior to the event date. After that lockout date, we cannot accept any changes.